This name uses Spanish naming customs: the first or paternal family name is Drexler and the second or maternal family name is Prada. Jorge Abner Drexler Prada (born September 21, 1964) is a Uruguayan musician, actor and doctor specializing in otolaryngology. In 2004, Drexler won wide acclaim after becoming the first Uruguayan to win an Academy Award, which he won for composing the song "Al Otro Lado del Río" from The Motorcycle Diaries. Drexler was born in Montevideo. In 1939 his father, a German Jew, fled to Uruguay with his family at the age of four to escape anti-Semitism. His family also fled to Bolivia and lived there. At the time, only Bolivia among South American countries was widely open to Jewish immigrants. And over six decades later as his gratitude to Bolivia he made a song, which is included in Bailar en la Cueva. His mother is a Christian of mixed Spanish, French, and Portuguese descent. Drexler was raised Jewish, but does not follow any organized religion. Like much of his family, he studied medicine and became an otolaryngologist—an ear, nose and throat specialist. Drexler began playing piano at age five, before attending guitar and composition classes. Although he had an interest in music, he became a doctor like both of his parents. He attended medical school in Montevideo. During his time in medical school, Drexler took a break to hitchhike through Brazil. He also studied music and recorded two albums, which were only released in Uruguay. Jorge Drexler performing with Tiê at the 2011 Rock in Rio Festival in Rio de Janeiro, Brazil. In 1995 he was invited to Madrid by well-known Spanish songwriter Joaquín Sabina, who introduced him to other important Spanish singers. Drexler went to Spain to record the album Vaivén in 1996 with Spanish musicians. Vaivén included some old songs from his previous releases mixed with new compositions. He moved to Spain and recorded another four albums: Llueve (1997), Frontera (1999), Sea (2001) and Eco (2004). In 2001, Drexler co-wrote two songs for Spanish singer Rosario Flores ("Agua y Sal" and "Rosa y Miel") for her album Muchas Flores. Drexler's song "Al Otro Lado del Río" appeared in the internationally acclaimed film The Motorcycle Diaries. Though Drexler himself sang the song on the movie soundtrack, he was not allowed to perform the song at the 2005 Academy Awards, since "he was not popular enough," according to Spanish newspaper El País; Spanish actor Antonio Banderas and Mexican-American musician Carlos Santana sang the track instead. Upon winning, Drexler recited two verses of the song at the podium. Drexler became the first Uruguayan to win an Academy Award. After that, he released 12 Segundos de Oscuridad (2006); this album contained ten original songs and two covers: "High and Dry" from British band Radiohead and "Disneylandia" from Brazilian Titãs. Although he lives most of the year in Spain, his albums were partially recorded in Uruguay with Uruguayan musicians. Juan Campodónico and Carlos Casacuberta, former members of rock band El Peyote Asesino, had produced Drexler's albums from Frontera to 12 Segundos De Oscuridad. In 2008, he released a double live album, recorded in diverse concerts in Spain: Cara B (2008), mainly filled with songs previously unreleased. During 2009, Drexler worked with Colombian performer Shakira on the Spanish-language versions of her singles "She Wolf", "Did it Again" and "Waka Waka (This Time for Africa). Drexler recorded Amar la Trama (2010) from November 1–4, 2009 in Madrid, Spain in just four days, with musicians playing live on studio. Drexler described the album as playful, without "the melancholy and anguish" of 12 Segundos. Amar la Trama was recorded in a television studio in front of a small audience who were selected in an online contest. He chose this format to avoid the "coldness" of the recording studio. His album "Bailar en la cueva", released in 2014, shows a new facet of the artist leaning towards rhythm and dance, a contrast to his previous albums which he describes as more introspective and nostalgic. In particular, he has pointed out that it is a very different album to the last one, describing it as the opposite pole to "Amar la Trama". His music is a combination of Uruguayan traditional music (candombe, murga, milonga, tango), bossa nova, pop, jazz and electronic music, which results in very personal compositions with original arrangements. The words also play an important role in his songs. Apart from love, reflections about identity, race and religions are a constant in his work. Drexler was previously married to singer-songwriter Ana Laan. His girlfriend is Spanish actress/singer Leonor Watling, with whom he has two children. Watling is in the band Marlango. His cousin is the scientist Alejandra Melfo. ^ "Jorge Drexler talks about his album '12 segundos de oscuridad'". Archived from the original on October 25, 2007. Retrieved 2008-06-22. ^ a b c d e Gurza, Agustin (February 27, 2005). "A songwriter's dream has disappointing end". Los Angeles Times. Eddy Hartenstein. Retrieved February 7, 2012. ^ a b c "From Alt.Latino, Five Conversations With Latin Music's Finest". NPR.org(Alt.Latino). 1 August 2014. Retrieved 7 January 2015. ^ "Ecos de Drexler" (in Spanish). Montevideo COMM. Desde hace mucho tiempo he perdido mi fé en todas las religiones organizadas. No creo en Dios.Al menos no de la manera en que se lo describe habitualmente. ^ Rohter, Larry (2005-07-12). "Latin American Singer's Rainbow Coalition of Identities". The New York Times. Retrieved 2008-06-22. ^ Bonacich, Drago. "Jorge Drexler - Biography". Allmusic. Rovi Corporation. Retrieved February 7, 2012. ^ Gurza, Agustin (March 2, 2005). "Opening Doors". Los Angeles Times. Eddy Hartenstein. Retrieved February 7, 2012. ^ "Muchas Flores – Rosario Flores". AllMusic. All Media Network. Retrieved February 7, 2011. ^ Hernández-Santos, Elsa (March 1, 2005). "Justicia poética para Jorge Drexler". El País (in Spanish). Prisa. Retrieved April 16, 2015. ^ a b "Drexler gana primer Oscar uruguayo". BBC Mundo (in Spanish). BBC. February 28, 2005. Retrieved April 16, 2015. ^ "Drexler critica a la organización de los Oscar por prescindir de él para interpretar su canción candidata". El Mundo (in Spanish). Mundinteractivos. Retrieved April 16, 2015. ^ a b Birchmeier, Jason. "Amar la Trama — Jorge Drexler — Overview". Allmusic. Rovi Corporation. Retrieved July 2, 2010. ^ Ayala, Ben-Yehuda (2010-09-16). "Shakira: The 'She Wolf' Billboard Cover Story". Billboard. Archived from the original on February 2, 2013. Retrieved 2010-09-20. ^ "Jorge Drexler lanza su disco Amar la trama este martes". RPP (in Spanish). Grupo RPP S.A. March 16, 2010. Retrieved September 20, 2010. ^ Drexler, Jorge. "Making of Bailar en la Cueva". Youtube. Jorge Drexler. Retrieved 16 April 2017. ^ "Leonor Watling y Jorge Drexler, padres por segunda vez". Europa Press. 6 August 2011. Retrieved 9 February 2018. ^ "Prima de Jorge Drexler expone su clara visión sobre lo que sucede en Venezuela". Todo el Campo (in Spanish). Retrieved 1 April 2019. ^ "18th Annual El Premio ASCAP 2010 – Pop/Ballad". ASCAP Latin Awards. American Society of Composers, Authors and Publishers. March 23, 2010. Retrieved April 22, 2015. ^ "19th Annual El Premio ASCAP 2011 – Pop/Ballad". ASCAP Latin Awards. American Society of Composers, Authors and Publishers. March 24, 2011. Retrieved April 22, 2015. ^ "19th Annual El Premio ASCAP 2011 – Television". ASCAP Latin Awards. American Society of Composers, Authors and Publishers. March 24, 2011. Retrieved April 22, 2015. 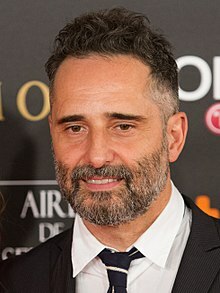 ^ "Jorge Drexler, nominado a los Grammy y premiado por la corona española". Ciudad (in Spanish). Argentina: Ciudad. September 11, 2010. Retrieved April 16, 2015. ^ "The Latin Grammys: Mexican Romance, Uruguayan Mellow And More". NPR.org(Alt.Latino). 13 November 2014. Retrieved 15 December 2014. "Una Canción Me Trajo Hasta Aquí"
This page was last edited on 3 April 2019, at 03:28 (UTC).